I've always been interested in science, but lack the commitment and resources (youth and money) to pursue an academic career. BOINC is a perfect way to bridge the two! After seeing several posts about using BOINC waste heat to offset utility bills, an idea was born... to keep an aquarium at a comfortable temperature with the minimum wasted electricity. Before chopping up your water-cooling rig, please note that aluminum is apparently toxic to fish. You'll want to use an anodized or otherwise well oxidized aluminum parts in the cooling loop, and also avoid copper and other heavy metals if you have invertebrates in the tank. Well, I suddenly became very lazy. The backup plan involved placing a regular Dell 1st gen i5 mini-tower with a very modest GPU in the corner of the bedroom, with fan outlets pointing towards the aquarium. Very low-tech. In spite of the lack of creativity, this approach actually works! The 100W aquarium heater is seldom on, and the room temperature has raised about 5C at night (measured with a laser heat gun thingy). This computer is currently pulling about 8 magnitude with the GPU, and probably about 8-10 more from CPU projects. As the computer pulls a bit less than 100W fully loaded, I'm calling this a win. Perhaps one day when I have a much larger aquarium and more free time (? ), I'll revisit this project. In the meantime, thanks for reading and please share - I look forward to more adventures with BOINC and Gridcoin! Sounds like it's already working well so why change it. 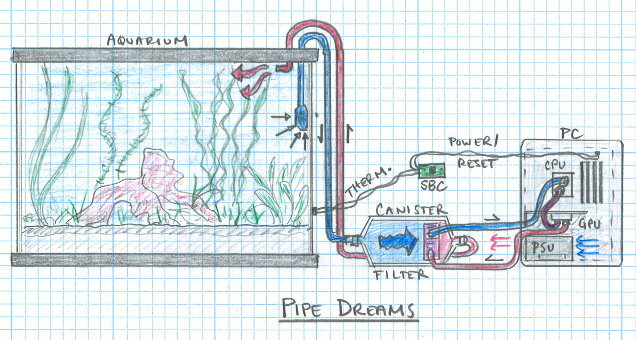 With the way you have things set up in the diagram, there might be some issues with fish poop/biofilm buildup in the water blocks which would impede flow and heat transfer. Could be true, although this is intended for the output side of the filter which usually has less gunk in it. How about rather than switching off the PC if the fish tank temp increases too much, you activate fans on an intermediary waterblock cooler so as to control the temp of the water more whilst running computation non-stop? I think you may also need to worry about the blue tube's suction being a hazard to fish? Congratulations @boincfish! You have received a personal award!